Scientists and volunteers who have spent the last month gathering data on how much plastic garbage is floating in the Pacific Ocean returned to San Francisco on Sunday and said most of the trash they found is medium- to large-sized pieces, making cleanup possible. Far away from California's coast, where the Pacific Ocean currents swirl, the blue of the sea was replaced by fishing nets, buckets, buoys, laundry baskets and unidentifiable pieces of plastic that floated past the Ocean Star, a ship carrying a team of scientists and volunteers gathering data on plastic garbage. "We were surrounded by an endless layer of garbage," sad Serena Cunsolo, an Italian marine biologist who works for The Ocean Cleanup. "It was devastating to see." Cunsolo, 28, was one of a team of 15 researchers and volunteers aboard the Ocean Starr who a month ago set out from San Francisco to study the plastic waste as part of the "Mega Expedition," a major step in the organization's effort to eventually clean up what's known as the Great Pacific Garbage Patch. 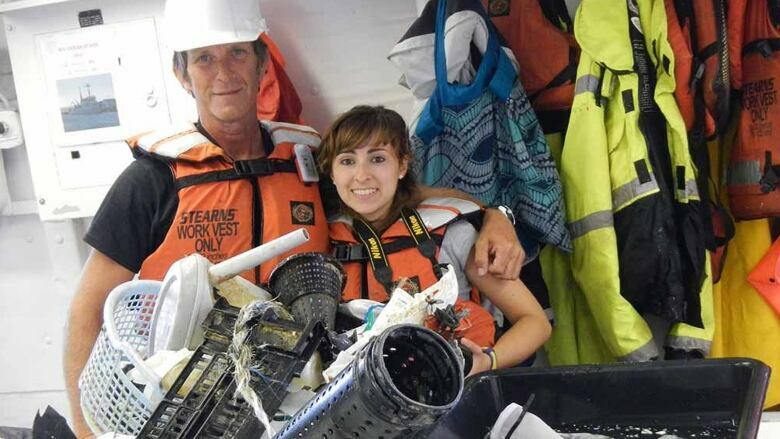 The 171-foot mother ship returned on Sunday to San Francisco, carrying massive white bags filled with plastic garbage along with two sailing boats with volunteers who helped collect the garbage samples. Boyan Slat, a Dutch entrepreneur and inventor, is the brains behind The Ocean Cleanup and the 'Mega Expedition' that returned to San Francisco with data from the Great Pacific Garbage Patch. (The Ocean Cleanup via AP)Most of the trash they found, including a one-tonne fishing net, is medium to large-sized pieces,rather than the confetti-like plastic shards that are often ingested by fish and birds, said Boyan Slat, who founded The Ocean Cleanup and has developed a technology that he says can start removing the garbage by 2020. "It was a good illustration of why it is such an urgent thing to clean up because if we don't clean it up soon then we'll give the big plastic time to break into smaller and smaller pieces," Slat said. The minuscule particles can easily enter the food chain after being eaten by small fish and birds and are extremely difficult to clean up, he said. Volunteer crews on 30 boats have been measuring the size and mapping the location of tonnes of plastic waste floating between the West Coast and Hawaii that according to some estimates covers an area twice the size of Texas. Slat said the group will publish a report of its findings by mid-2016 and after that they hope to test out a 1.6-kilometre barrier to collect garbage near Japan. The ultimate goal is construction of a 100-kilometre barrier in the middle of the Pacific. The expedition was sponsored by The Ocean Cleanup, an organization founded by Slat, a 21-year-old innovator from the Netherlands who has envisioned using long-distance floating barriers that will attach to the seabed and target swirling ocean currents full of waste and skim garbage from the surface while aquatic life and the currents themselves pass underneath. He became passionate about cleaning the oceans of plastic while diving in the Mediterranean Sea five years ago. "I was diving in Greece and realized that there were more plastic bags than fish, and I wondered why can't we clean this up," Slat said. After dropping out of university after his first six months, Slat dedicated his life to developing the technology the group will start testing next year. After a 2012 Ted Talk about his idea was viewed more than two million times, Slat decided to launch a kick-starter campaign and raised two million euros (about $2.27 million US) that helped to launch his organization. Soon, his innovative solution got the attention of major philanthropists in Europe and Silicon Valley, including Salesforce.com CEO Marc Benioff, who are helping pay for the data-gathering efforts and the technology's development. The Pacific expedition, which will end in mid-September, will gather data that will be more extensive than what has been collected in the past 40 years. It also will give a better estimate of how much plastic waste is in the Pacific Ocean, Slat said. The boaters are using GPS and a smartphone app to search for and record the plastic. They take samples and ship them to the Netherlands, where the plastics are counted and recorded. The Great Pacific Garbage Patch was discovered by Charles J. Moore in 1997 as he returned home from the Transpacific Yacht Race, which starts in Los Angeles and ends in Honolulu.